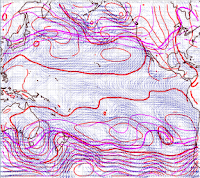 Some areas, like south Pacific, south Atlantic, are apparently not covered by weather faxes, but it is possible to retrieve GRIB files for those regions, as they are computed using a model. In order to have on those binary data a view equivalent to what the weather charts would be showing, it is necessary to detect the contour lines from the GRIB, about the PRMSL, 500mb, waves heights, temperature, or whatever data the GRIB would contain. This is now done, and here is the rendering it makes. I'm not sure the algorithm wouldn't deserve some improvements (actually, I'm sure it will), but it seems to render the data I'm expecting. Click the image (top-right) to enlarge it. That should be very useful for the areas not covered by the faxes.